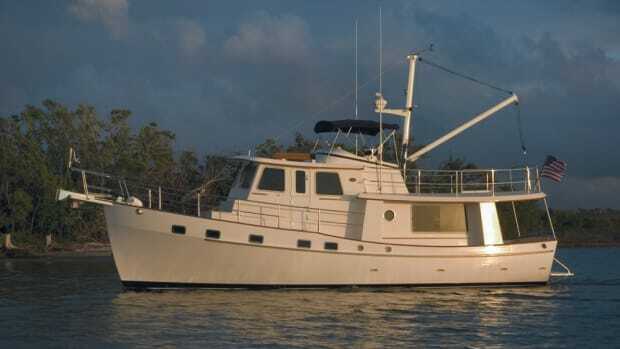 The first time I laid eyes on the Krogen 55 Expedition, in the Hutchinson Island Marina at this year’s Stuart Trawler Fest, I immediately wanted to board her and go to sea. 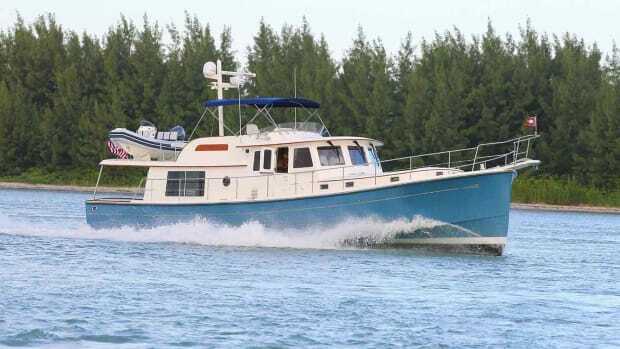 From her high, full bow sections to her expedition-style pilothouse to her well-protected starboard side deck, she seemed purpose-made for safe and comfortable passagemaking. And even though strong winds were blowing relentlessly out of the southeast the week I joined Kadey-Krogen Yachts’ vice president of sales and marketing, Larry Polster, and Gregg Gandy, one of the company’s service managers, to deliver the boat from their Stuart, Florida, headquarters to Miami in time for the boat show, I had no misgivings about our planned two-day delivery. It was the perfect opportunity for me to see the Krogen 55 in action, and I wasn’t about to miss it. This boat was made for big waves and open water. The conceptual design and styling was Kurt Krogen’s, with a lot of the preliminary naval architecture by Jimmy Krogen, who owns the James S. Krogen & Company yacht design firm founded by his grandfather. Wyatt Higgins of Tom Fexas Yacht Design did the final styling and engineering. “When we started the project, we didn’t want to just build a bigger, better-looking Whaleback,” said Polster. “We wanted to improve some of the fundamental things that made the original design so successful. The word Expedition in the title indicated to me to that the boat has plenty of tankage for the long haul, excellent seagoing capabilities, and room for the equipment and stores required when voyaging long distances. But that is a description of most of the boats built by Kadey-Krogen. From the beginning, the 55 Expedition was designed for twin diesels. Polster told me that the 58 was designed to be powered by a single engine or twins, and that hull number 1 was a single, but it is the only one to date; all the rest are twins. Single-engine 58s have an extra 12–15 inches of draft for the big wheel. For the 55 Expedition, twins add get-home capabilities: one engine will push the boat at 8 knots. Single-engine boats with some sort of auxiliary system don’t offer the same get-home speed potential. The shape of hull below the waterline includes a fine entry forward for clean wave entry and a fine exit aft with a V-shape: the well-known Krogen wineglass stern, which minimizes the amount of hull in the water and improves the downwind ride. Above the waterline, the forward sections are more full, so the stem is fairly vertical. The high freeboard forward is made for big seas and for increased reserve buoyancy. The fullness amidships carries well aft, ending in a beautiful tumblehome at the transom that accentuates the springy sheerline forward. Premium Cook gelcoat makes the outer surface of the 55 Expedition shine brightly and wear well. The solid fiberglass lamination below the waterline incorporates vinyl ester resins in the first laminates for optimal resistance to osmotic blistering. Impact-resistant aramid fabrics are used to reinforce the stem and stern bottom areas. Above the waterline, and in the superstructure and decks, Knytex (mat and Airex) cored sides add strength without excess weight. There are four structural bulkheads with Freeman watertight doors in the hull. Climbing down the ladder located near the base of the stairway into the compartment referred to as the machinery space, you can look forward through a watertight door opening and see the bow thruster tube in the far forward compartment just behind the aramid-reinforced, solid watertight collision bulkhead. The next compartment contains the tanks for black and gray water and the house batteries (properly secured and boxed) in racks, and it is separated from the machinery space with another watertight door. 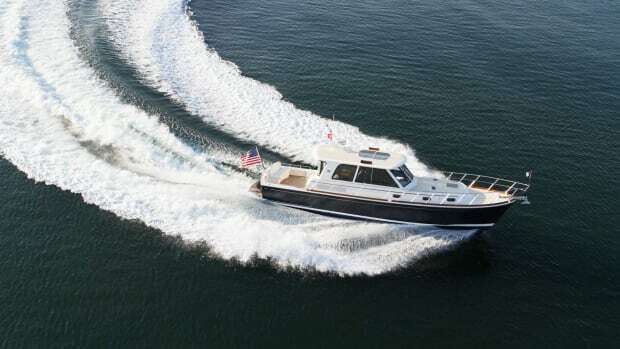 The machinery space holds the 30-gallon water heater, two freshwater pumps, dual VacuFlush systems, twin 270-gallon stainless steel freshwater tanks with sight tubes and large inspection ports, an auxiliary Frigoboat freezer, a workbench, and the chilled-water air conditioning units. 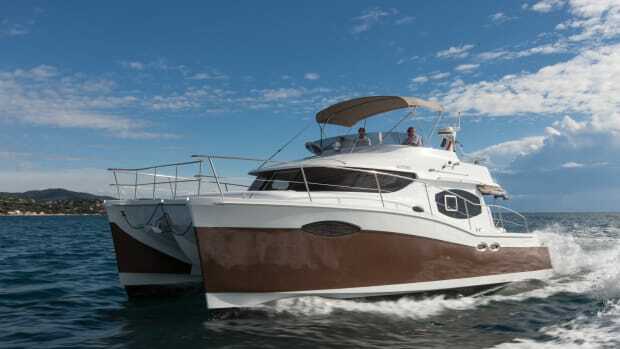 The engine room is through another watertight door aft, and the first thing you see is excellent access to the American Bow Thruster TRAC 250 stabilizers on both sides. Fuel management is key, so twin sets of dual-filter Racors for engines, and one for the 16kW Northern Lights genset, are found on the aft engine room bulkhead, easy to inspect and service. Another large Racor filter outboard is dedicated to the ESI CFS1000 FR Clean Fuel Solution System, standard equipment on the entire line of Krogen yachts. The main aluminum fuel tanks are port and starboard, built with heavy aluminum construction and huge inspection ports. There are good handholds along both sides of the walkway between the 158hp John Deere 6068TFM main engines, and plenty of room to work on all sides. With approximately 5 feet 6 inches of headroom, it will be easy to check the genset regularly and gain access to the starting batteries. Universal power converters on the aft bulkhead allow owners to plug in anywhere in the world. There are PTO (power takeoff) units on each motor and on the genset, and it is important to note that the PTO on the motor is large enough to handle the demands of the ABT bow thruster or the Maxwell 3500 windlass at idle speeds, with no need to start the genset or rev the mains. Centek water-lift mufflers for the mains exit out the transom. Fuel and hydraulics handles are easy to reach and all are labeled. With wiring chases running cleanly fore and aft, the engine room is well organized for service. Aft deck access is through starboard side doors and a transom door. Generously sized hawseholes lead to large cleats mounted on the bulwark sides, which are hip high for safety. On both sides forward, you’ll find fuel and water fills recessed in overflow pockets—a nice touch—plus electrical (for the two remote-controlled Glendinning Cablemasters), city water, TV, and cable receptacles grouped together on the starboard side. To port, a stainless steel ladder with teak treads leads up to a hatch to the boat deck, and there’s a large locker with a stainless sink on top and storage below. Twin Freeman watertight doors open wide and latch securely, making the aft deck, which is well protected by the overhead boat deck, an integral part of the saloon space on nice days. With its sides pushed out to the gunwales, the saloon is massive. It’s a comfortable living space finished in flawless cherry woodwork and cabinetry, and furnished with an L-shaped settee to starboard that’s long enough to stretch out on when naptime rolls around. Lighting is provided by i2Systems LEDs, a leading-edge system that can be adjusted to meet your needs. A Raritan Icer-Ette ice maker in the bookcase base is standard, as is the large, foldout-top cherry table with a high-low base. A GE wine cooler is also standard. The galley is one of the roomiest and most architecturally interesting spaces I’ve seen on a cruising boat, with a large Jenn-Air refrigerator-freezer and Viking gas range both rotated at 45 degrees, creating space along the centerline hallway for a lighted cabinet, plus storage farther forward. Beautiful granite countertops provide loads of working space, with a GE compact trash compactor and Miele dishwasher below, and there are loads of cabinets and drawers for stores, cutlery, pots, and pans. The sole is a handsome cherry parquet, also found in the saloon and cabins. 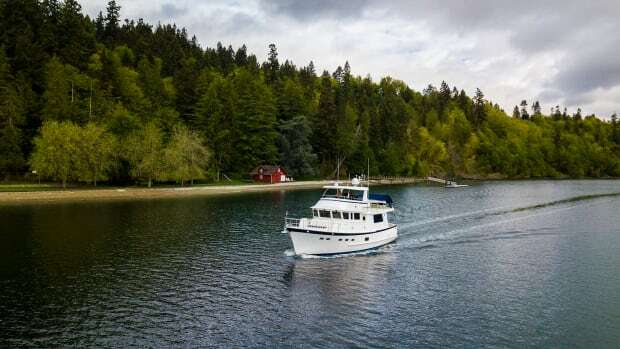 As befits the owner’s accommodations, the master stateroom is graced with a full-size island queen berth, abundant storage with slatted door fronts, beautifully matched cherry paneling, and a large en-suite head compartment. 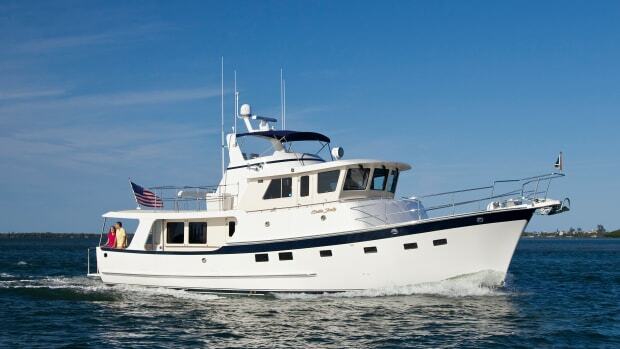 Four opening portholes and two overhead hatches ensure abundant natural light and ventilation. The starboard guest cabin, configured as an office or den, has a settee that converts to a double for occasional visitors. 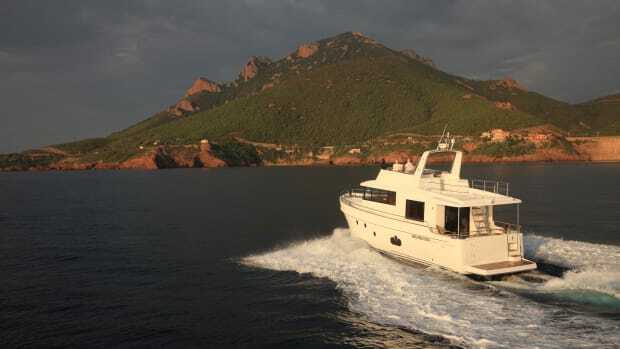 The day head is across the hall to port, and, like the master head, it features granite countertops, a separate molded-fiberglass shower compartment, and a SeaLand VacuFlush toilet. As we motored toward the St. Lucie Inlet, making 8 knots at about 1800 rpm, I prowled the interior of the 55 Expedition with my sound meter. I recorded 68dBA in the saloon, 67dBA in the galley, 64dBA in the companionway, 66dBA in the guest stateroom, 61dBA in the master, and, finally, 58dBA in the pilothouse. Acoustic engineering and a liberal dose of Soundown noise dampening in the engine room paid off handsomely. I slipped out one of the two Freeman Dutch-style watertight pilothouse doors and toured the upper deck, taking a moment to appreciate the dual wing control stations behind the full-width Portuguese bridge, then wandered back to examine the Nautical Structures Euro 1,200-lb. davit. The foredeck is well protected with welded handrails and an intermediate lifeline that extends to the end of the bow pulpit, where two anchors can be stowed at the ready. The big Maxwell 3500 has a dual chain wheel and capstan. A Freeman watertight deck hatch ensures that the anchor locker will not flood accidentally in big seas. Keeping watch from the pilothouse in one of the two Stidd helm chairs, I enjoyed the luxury of 360-degree visibility. The three big Exalto windshield wipers kept the small amount of spray at bay. The large cherry helm console had room for three big displays, with a flat area ahead of the wheel for the engine instrumentation, ZF Mathers MicroCommander throttles/shifters, and the bow thruster control. A large chart table set to starboard included storage below. The L-shaped settee behind the Stidds was set at just the right height to let guests enjoy the same view as the helmsperson and mate. The view ahead most of the day was 6-footers on the nose, which shifted to the port bow as we made our way south. The sharp bow of the 55 Expedition cleaved cleanly and took the thump out of what could have been a very unpleasant ride. At nightfall, as we turned in to Port Everglades, I finally had a chance to experience the downwind ride of the yacht’s wineglass stern. The boat rose vertically as the waves came up under our stern, but there was no need to saw the wheel—the hull tracked very straight, right down the center of the entrance from the lighted PE sea buoy. If you followed the progress of the Krogen 55 Expedition on Kadey-Krogen’s website or in its newsletter, you know that there was a lot of anticipation as this boat went through development and construction. If you get a chance to spend a day aboard with some of the Atlantic’s nastiest chop on the nose, I think you’ll agree that it was definitely worth the wait.